Last weekend, the rescheduled 2018 Keelboat Championship was sailed on Queen Mary’s reservoir in the Royal Thames YC fleet of j80’s. Here’s a report from the event. 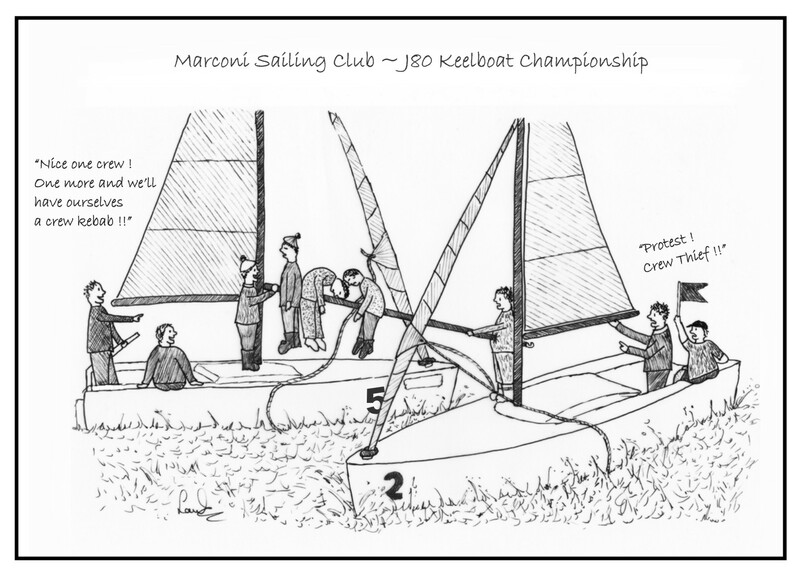 38 Marconi sailors representing a very wide cross section of the club, competed in 8 teams to become the 2018 keelboat champs. 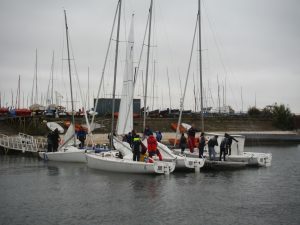 Members who travelled from as far away as Cyprus and Aberdeen to compete in constant rain and a forecast that threatend ever increasing gusts as the day progressed, simply pulled up their hoods, fastened collars, and headed out to the start line. The many spectator members that also travelled, found the warmth of the club house a little more inviting, so we’re a bit short on photos of the event, but club cartoonist Laura Ivermee recorded the event from the bow of boat No8. Thanks Laura. 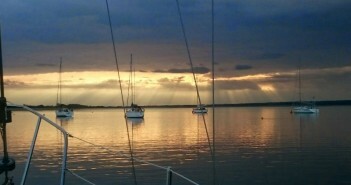 After working out how to rig the unfamiliar boats, (what’s this long pole with hooks on the end for?) each set off to the start line where race officer Roger Smith awaited to get the event underway. With kites flapping, wineglassing, and sheets getting into a terrible knot, some wisely decided to race the short downwind legs without the kite, while those that persevered either mastered it, or got into an even bigger mess and lost further time. Straight out of the blocks, were reigning champions team ‘Barking Spiders’. 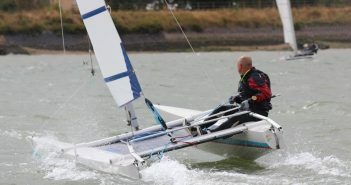 With Tristan Hutt on the helm, they scored 3 firsts whilst Jack Collis’ youth team took a while to get there teamwork going, but they quickly followed, with two wins on the bounce in races 4 and 5. 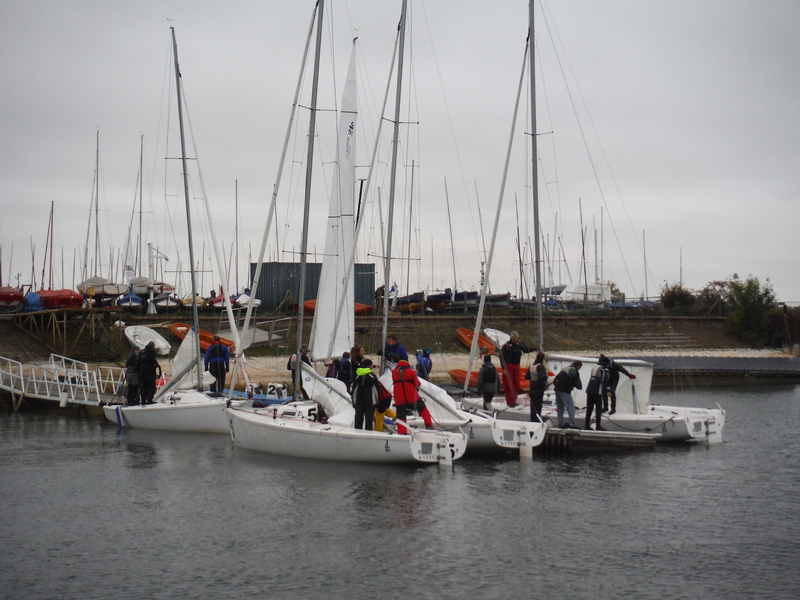 The competition was hotting up, if not the weather, and those teams that had been shy at the line in the early races, started to get into the mix making for some exciting racing in the 15-20 minute races. Most of the time boats were gunwale to gunwale on the downwind legs which was interesting as at times there was little room to manoeuvre unless you were outside boat. This lead to forced gybes, crews hanging onto shrouds waist deep in water, and quite a bit of shouting ‘starboard’. Pete Claytons boat even managed to skewer crew members on Richard Robarts boat with their spinnaker pole, more jousting like than sailing. By now, Sophia Southgates boat with their strategy from the start of leaving the kite and pole below decks, were consistenly scoring in the top half of the fleet, but with Tristans team now winning race 6, they looked all set to retain their title. Now very wet, and with some crew members begining to show signs of becoming very cold, the race officer sensibly called for just two further races. Anna Nicholls team set about to improve their middle ranking position, while hoping to influence the scores of those boats ahead of them. Lydia Coffey’s team rotated helms as they chased the pack, and Ian Ivermee’s came strong to shuffle the order of the lower half of the fleet. 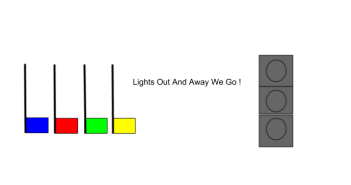 Race 7. Jack’s team took a win, with Tristans team pushed into 3rd by Sophia’s. 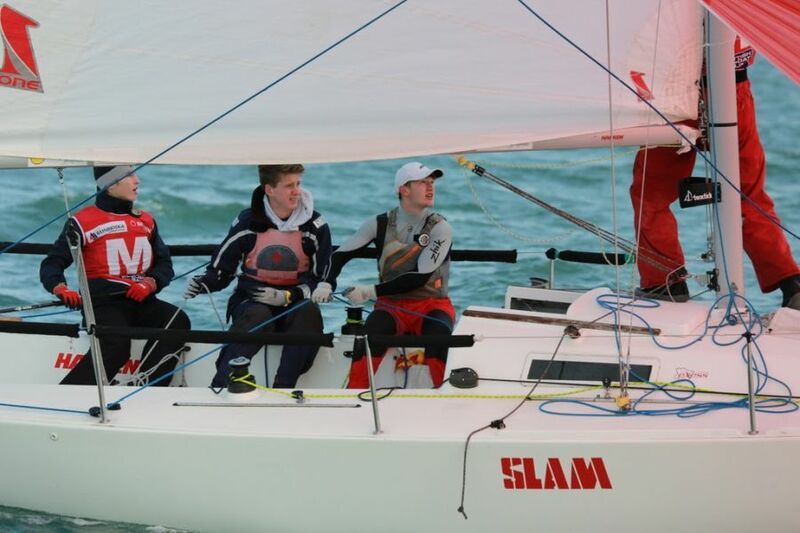 The scores were now level between Jack and Tristan as they went into the final race. This was really exciting, although probably most boats were unaware of how close it had become, otherwise occupied by ducking transom’s, recovering poles lost overboard and generally trying to cover those boats behind them. And then it was done, one short race and the 2018 champions had been determined. 2nd place, and winning the first team of 5 crew with two ladies, were ‘Barking Spiders’ Tristan, Bryan Spencer, Tom Clayton, Julie Spencer, Rhiannon Hitt. 3rd place went to Sophia’s team, with Oli Southgate, Pat Shaw, Graham Cross. Whilst Anna’s team ‘Nicholls-Collis’ were 1st team over a certain age (Ed, work it out for yourself). Anna, John, Caroline Nicholls, Richard, Suzanna Collis. 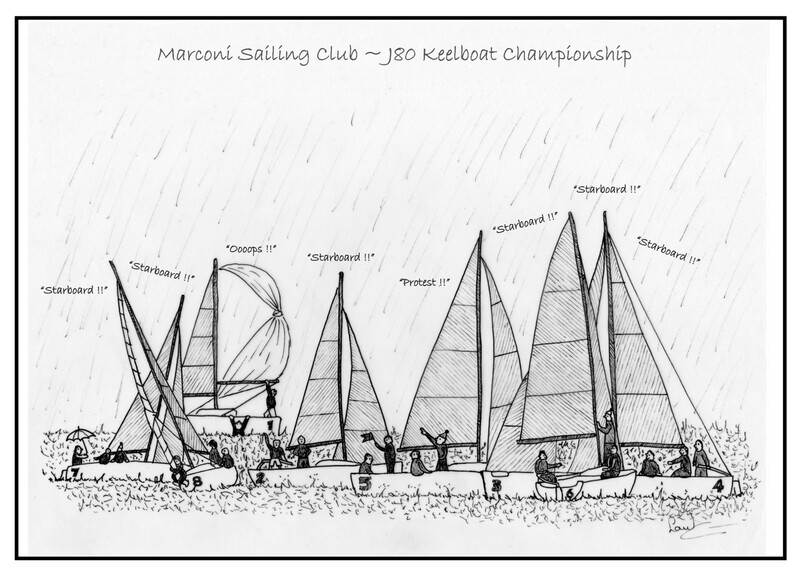 Well done to all the teams and especially to Roger Smith who shadowed the Royal Thames RO throughout the day so that Marconi might learn from his experience, and perhaps incorporate this type of racing into it’s provision for members.